Hi again, I couldn't last the month without doing some mini-ing and plates are an excellent 'front of the TV at night' project. After books I have a passion for china. 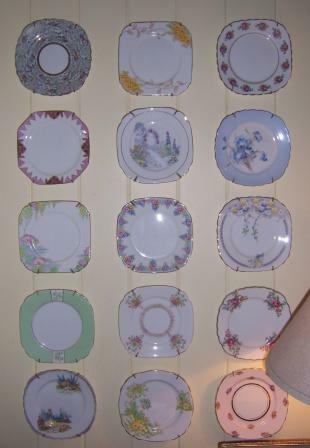 I have no idea how much I own - it hangs on walls, fills cupboards, overflows into the bathroom and laundry and garden. 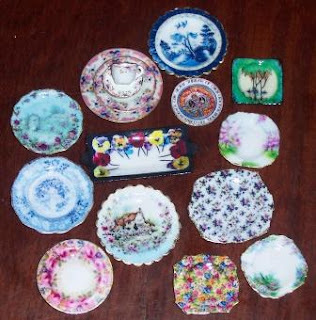 I am strict about not getting more (40 or so trios is already probably more than I will ever use) and as most of my love is china from the 1930s, my dolls house was the obvious place to keep 'collecting'. Given my lack of control when faced with china, I decided to make my own for the cottage so I could have whatever I wanted ...and lots of it! Some of these I could never dream of owning in real life but Mr and Mrs Hollyhock Cottage (they will have a name one day) were lucky enough to number among their wedding gifts Clarice Cliff and Royal Doulton 'Pansies' sandwich sets, a Grindley dinner set, Art Deco display plates and Royal Winton chintz. 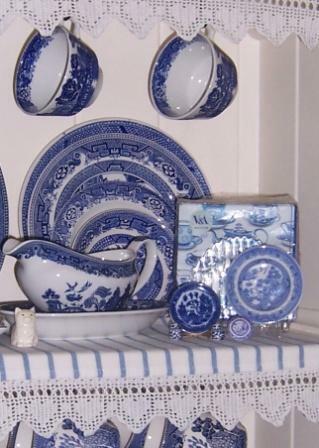 This in addition to inherited Victorian transferware and flow blue pieces and oddments from Mrs HC's 'bottom drawer'. 1. Fill a page of Word with clear images of your desired pieces. You can format them to the size you want here and adjust brightness and colour. I usually copy 2 of each plate as my printer is prone to adding stripes or splodges and it doubles my chance of getting a good copy. Print out a sample page to double check and then print again onto light card - photo paper is fine but not necessary - my printer objected to it.Spray with a matt paper sealer and allow to dry. For inspiration you can visit online gift stores or museums. 2. 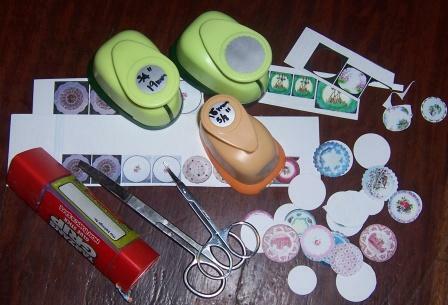 If you want round plates, scrapbooking punches are wonderful but if you don't have any, curved nail scissors used carefully will give you a lovely scalloped edge. The joy of these plates is that you can have whatever shape you want! Cut a coloured copy of each plate and a plain copy from light card. If you are not using a punch, it is easiest to glue the cut coloured top onto the uncut plain card then cut the plain back carefully around the coloured top. 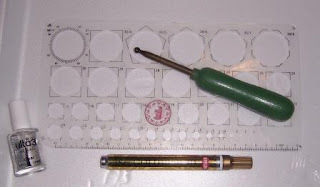 If you are really inspired you can print a page of backstamps to cut your backs from! Glue the front and back together with a dry glue stick and tuck under a heavy phone book while you cut some more out. When dry enough not to separate, but not entirely dry, pop the plate on top of plastic circle template choosing a circle size to form the indented centre of the plate. With the rounded polished end of a paintbrush or a large embossing tool (mine came from the markets and I think may have started it's life in millinery) carefully push the ball point around the circle to give the plate shape. You can do this under the plastic circle template onto a foam mat, but I found the first method more effective (if you need an irregular shape, a mat is excellent without a template). The sides may crinkle as you go - just push them back flat with your embossing tool. Don't worry if it isn't looking exciting yet. 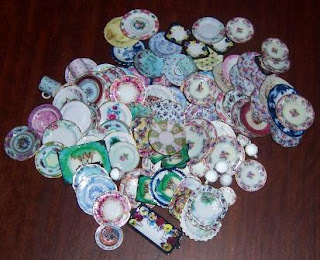 Now for the part reminiscent of Victorian pottery hazards. Open all windows and give the top of your plates a coat of nail varnish. When dry, varnish the back. Repeat until you have a lovely gloss level, I found 3 front coats and 2 back coats to be effective. When the varnish has hardened run along the edge with a gold paint pen and you are finished! Cups and saucers are metal from Phoenix Model Developments I did try a quilled cup but wasn't thrilled with it- maybe someone else can perfect it and share the technique. Mugs were rolled paper and need a bit more work too. Leny at lediteds who, as you may have guessed, makes and loves bears and other lovable soft toys. While her bears are adorable, I am taken with her dogs which are really cute and different. Miniami keeps a running blog of the projects she works on herself and at her club and inspirational they are too! Go and browse Mirels blog and come out feeling like creating. Tonight is one of those nights when google translate pushes my poor computer to the edge of crashing so while I can see the most wonderful pictures of food on Il CucchiainoMagico I don't know the stories behind it so will have to call by again. Mieke's petite victorian rose is full of beautiful Victorian minis which would be wonderful in a modern shabby cottage. I just love looking at the pretty things others make so I loved this blog. Astrid's blog is a feast of delightful and romantic bear themed pictures - what a winning combination! I doubt that Caterina needs any introduction as she is seen everywhere, inspiring and encouraging. Sadly, her blog is another I love but doesn't love my computer so to get in is a special treat and I was smiled on the other day when I finally was able to add myself to her followers list and see her amazing BOOKS! Wow! After many varied careers Kathy at Wee Little West has settled down o maing mini cakes and looking at them I think it is what she was born to do. They would be stunning in 1:1 scale - shrink them to 1:12 and they are amazing. As a bonus Kathy has a giveaway for her followers ending on Saturday so head over to visit. Thank you for following me and I hope you enjoy what you read here. For the past week and during February I am giving my time to another project so no dollshousing for me! This means I have an entire post to catch up on my welcomes. My 't' isn't cooperating today without a few good bashes so if there are any unusual phrases, just see where you can add a t to create a more convenional word (Discussing 'boiled peanuts' on a forum with the t missing was probably a concern). Norma at make mine mini is currently a Sydney girl but her heart remains firmly in her little cottage in New Zealand. As well as her miniatures I have enjoyed looking at her home which is a mix of vintage and pretty set in a stunning location. Sherry is about as girly as you can get and this is reflected in her blog so for a feast of friendliness, feminity and family and beautiful photography call by and leave a comment. Maija from iidasanttu is another whose life and blog revolve around family and simple pleasures. How many others already have a Christmas countdown going! I'm enjoying her photos and am still working through the language list in google translate to enjoy the text as well. 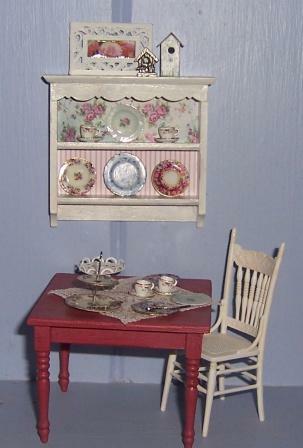 Sylvia has the most awe inspiring ability to create realistic scenes in her miniatures. If you have an evening to spare, keep going back through posts to see the deail she puts into her work. 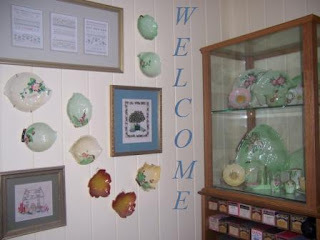 Her home blog is of the same style but perhaps simpler and beautifully pristine. Another sewer and creator of beautiful soft dolls is siebedina. Her most recent post makes you appreciate the perserverance and optimism she needs for her creativity to blossom. She is awe inspiring. Anyone who creates beautiful books is sure to have my attention and the books at Life in Miniature are stunningly beautiful. Make sure you check her free project links and miniature projects gallery as well. Wow! As often happens, I am tantalised by hese followers who I can't find blogs for yet am sure I have seen while browsing, so if anyone has links for minineedleworker, Eli en Karina, Kelly and Iluna45 please pass them on. I always enjoy doing a welcome post and seeing the amazing things people are doing out there. Have a creative February and I will see you all in March! my new clean and improved craft room! The Little World I Live In! Sometimes being a worker's mate is hard work! Collinge Antiques Daily Blog & New Stock List.